I never thought I would write the top heading for this season, that what it looked like, it was just time before KKR team would have decided to make Hard hitting Yusuf Pathan sit in bench but it was not to be. Defending Champions need to win all their remaining games to qualify for Play off. Royals won the toss and decided to Bat first, a slow start but strange & bizarre tactics fro Dravid kept the runs in bay and wickets kept on falling without anyone consolidating the fall. Dravid coming at no.8 didn’t help any cause. KKR also bowled well and kept the pressure always. Royals trying to defend 133 runs, started off well by picking 2 quick wickets but that it, Both Kallis & Yusuf Pathan ensured they crossed the line without any more fuss. Pathan got almost close a Half century and missed by a run, when Kallis struck a boundary when team need 3 runs of 18 balls. – Dravid batting at the 8th position today is the first time in his IPL career. – Bisla scored the 400th six for this season. – After 11 innings Yusuf Pathan has gone past 30 runs in IPL. 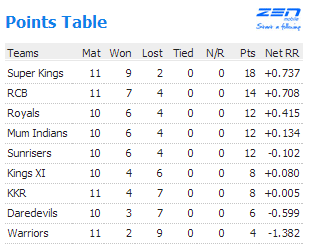 – Rajasthan have never won a match scoring less than 135 runs, now the wack record stands 12-0. Longest Six – 119 Meters by Chris Gayle against PWI. Fairplay Award – Rajasthan Royals.